As I have pulled my hamstring before, I knew it was bad as soon as I went down. I stepped off my left leg and was about to put power through my right and I felt it then. It is hard to describe my feelings at the time; I was so disappointed. To play and perform on stages like that semi-final against France is why you make all the sacrifices and I was enjoying the game. I was hoping it would be some sort of chronic spasm or cramp but the scan on Sunday showed a pretty significant tear so unfortunately that is me out of the final. 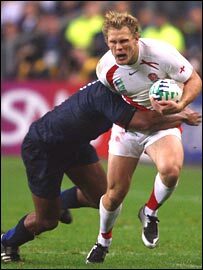 I have played more games for England over the last year than anyone else and, with Ben Kay, I was the only one to have played every minute of this World Cup up until I came off. I watched the rest of the France game from the substitute's bench although I couldn't walk around the field to applaud the crowd at the end. The rest of Saturday and Sunday I tried to reduce the swelling and the bleed in the muscle. Ultimately though it was not to be and the realistic prognosis is that I will be out for three to five weeks. My hamstring is still quite sore but it is not as painful as the heartache of missing out. It will be very difficult to watch the final this weekend, sport can be quite cruel at times. But I can take solace from the fact that I have done everything I possibly can. You have to be quite philosophical about it even though it is a bitter pill to swallow. However, now is the time to get behind the team - making sure that we win this weekend. It is not the time for self-pity. I will stay in Paris this week and I will do anything to help the team. I have to remain positive. It is a whole squad effort. It's not all about the 15 lucky ones on the field. If the players who are not involved go off and become selfish then they can have a negative influence. The press obviously concentrates on who kicks the points or scores the tries but the other members of the squad do not get the credit they deserve. After the victory on Saturday I was in the medical room so in there the celebrations were hardly crazy but the euphoria in the squad after beating the host nation is amazing. Some of the players had a couple of beers while others were with their family and loved ones. We have been away from home a long time. We are now in the final but to come this far and fall at the last hurdle would be the bitterest pill of all. 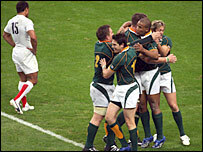 No one would have predicted that we would face South Africa again after we lost 36-0 to them in the pool stages. The players have to take an enormous amount of credit after taking the initiative and putting things right after that result. You write people off at your peril in sport. It has a strange way of coming back and biting you on the backside. Confidence is high after the wins over Australia and France. We have improved our performances each week and it's vital we deliver again in the big one. The important thing is that we don't give away silly penalties, we establish periods of pressure in the opposition's half and take the points when they are available. Having guys in the team that have played at the highest level and won medals adds a dimension to the squad. Even when you have not taken opportunities or when you've missed kicks at goal, the guys don't panic. They handle the pressure and thrive on it. I don't care how or why, as long as we beat South Africa on Saturday. That's all that matters. Although I will not be on the field, I just hope that we can perform again this weekend. If we can win, it will be one of the most amazing sporting turnarounds of recent times.